Sebum is a complex and variable mixture of lipids including glycerides, cholesterol, squalene, and free fatty acids. It is a protective coat of oil which prevents various bacterial infections and keeps our skin hydrated. Increased sebum production is an unpleasant skin disorder. Too much sebum and dead skin cells can result in pimples, whiteheads, blackheads and other lesions. 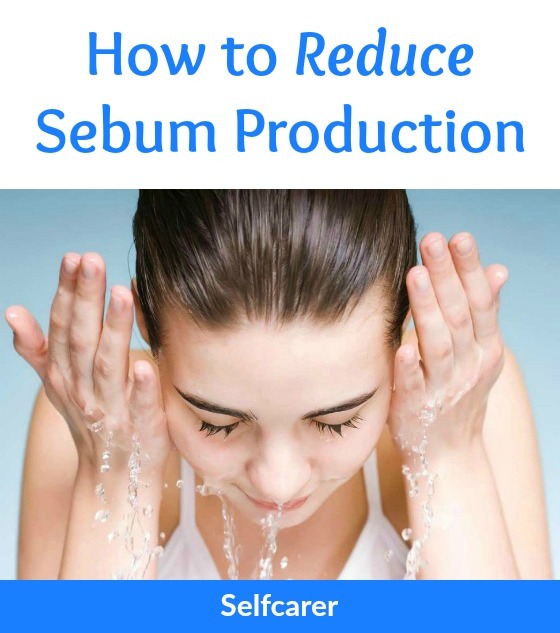 You can’t stop the sebum production completely, but you can reduce the amount secreted. Sebum is produced by the sebaceous glands. Sebaceous glands are found over most of the body, although there are few on the hands and feet and none on the palms and soles. Normally, sebaceous glands should help in lubricating the skin and hair, protecting them and maintaining health and luster. However, sometimes they become overactive and secrete too much sebum. Sebum production is controlled by a hormone called dihydrotestosterone (DHT). DHT is responsible for triggering sebaceous glands to produce sebum. Higher levels of this androgenic hormone, or an increased sensitivity of the sebaceous glands to normal levels of DHT can increase sebum production. Other causes of excessive sebum production is unhealthy diet and poor skin care routine. Fortunately, you can reduce sebum production by changing your diet and lifestyle and following a regular skin care regimen. Drink enough water. Hydration is very important for maintaining healthy skin. Water helps reduce sebum production by giving your skin the right water to oil ratio. Not drinking enough water can cause dull skin, wrinkles, and more prominent pores. Likewise, dehydration and overproduction of sebum are frequently linked together. Drinking lemon water is great too. It keeps you hydrated and it’s rich in antioxidants and vitamin C. Lemon water is also effective for curing acne. Drink it in the morning on an empty stomach for healthy skin. Eat a healthy diet. Foods that are rich in antioxidants and omega-3 fatty acids will improve the appearance and texture of your skin. Eat natural foods and fresh fruits and vegetables as much as possible. Avoid foods high in fat and sugar which cause oily skin. Oily and greasy foods aggravate oily skin conditions. Cut out unhealthy fats like in butter, fried food, and beef. Replace them with healthy fats found in foods like nuts, seeds, avocados, and fish. For omega-3 fatty acids, eat foods like salmon, walnuts, and flaxseed. If you don’t eat fish, considering taking fish oil as a supplement. For antioxidants, eat foods like blueberries, cranberries, beans, apples, spinach, whole grains, and peppers. Bright colored fruits and vegetables are high in antioxidants. In small amounts, chocolate is also proven to be good for your skin. Consume vitamin B2 and B6. These vitamins help the body control sebum production. Sunflower seeds are a great source of both vitamin B2 and B6. Other foods that are high in B6 include fish, poultry, red meat, and beans. If you’re not getting enough B vitamins from food, you can take an over-the-counter supplement, available at drug and grocery stores. Consume vitamin A. Vitamin A is an essential vitamin for immune function and good eyesight. According to studies, you might have low levels of vitamin A if you have severe acne. Vitamin A is an anti-inflammatory substance that balances your hormones and might help reduce sebum production. You can increase your vitamin A intake by eating a healthy diet. Vitamin A-rich foods include sweet potatoes, carrots, dark leafy vegetables, liver, red pumpkins, dried herbs, tomatoes, eggs, and mangoes. Consume zinc. Zinc is an essential trace mineral with antioxidant properties. It controls sebum production and can be obtained from red meat and poultry. Oatmeal contains both zinc and vitamins B2 and B6 and is a great thing to eat to help control greasy hair. Try turmeric. Turmeric can reduce the oil secreted by the sebaceous glands. Add turmeric to a few drops of lemon juice, and then add some water to make a scrub. Apply this paste to the affected areas, and let it sit for 15 minutes. Wash it off with lukewarm water. Use green tea ice cubes. Make ice cubes from strong green tea and use these on your skin. In addition to its anti-inflammatory and antibacterial properties, studies have shown that green tea can actually help reduce sebum production. Try witch hazel. Witch hazel works as a great natural facial toner. It will close up your pores and dry up excess sebum when applied to your face after washing. Pour a bit of witch hazel onto a cotton ball, and dab it onto your face after washing. Exercise regularly. Regular exercise has been shown to provide a range of benefits to your skin. It releases endorphins which lower stress levels and therefore reduce sebum production, and also makes you sweat which cleanse out dead skin cells. Try exercising on a daily basis for a minimum of 30 minutes. Make sure to always shower after exercise to wash away the sweat and bacteria. If you let it build up, it can lead to more skin problems. Reduce your stress. There is a strong link between mental health and skin health. Research has found that high stress levels cause higher levels of androgens and cortisol. In turn, this stimulates the sebaceous glands causing them to increase sebum production. So give yourself some time to relax. Try taking a bath, meditating, reading a book, or practicing yoga. Cleanse your face. Most dermatologists agree that cleansing the skin is the best way to reduce sebum production. Make sure to use a gentle, pH balanced cleanser rather than regular soap. Most soaps are highly alkaline and strip the natural acid mantle from the skin leaving it vulnerable to bacteria. Products containing benzoyl peroxide, salicylic acid, and glycolic acid are often considered best. When washing your face, make sure you use warm water, not hot. Hot water can further irritate the skin. Avoid over-washing your face. 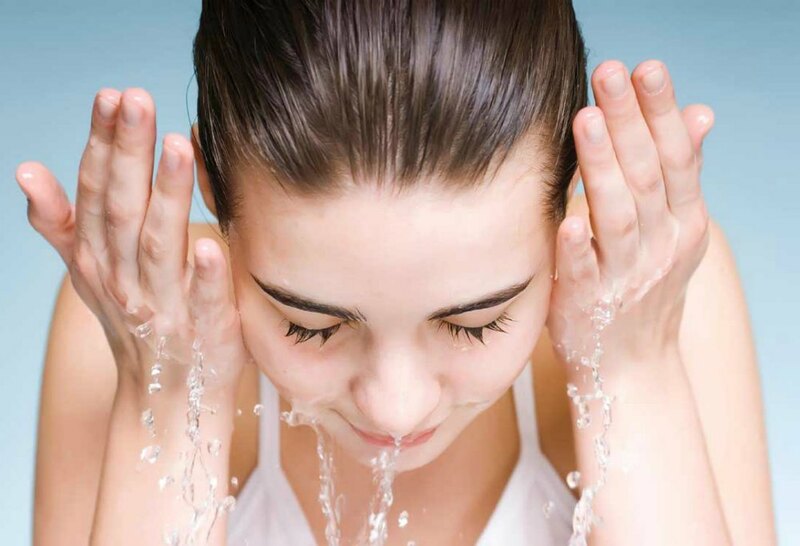 Washing your face too often dries out your skin, causing your body to try to compensate by producing more sebum. Washing your face infrequently causes old oil to build up. Find a happy medium by washing your face twice daily; when you wake up and before you go to bed is the best time. Avoid harsh soaps and creams. Any products containing alcohol or other harsh chemicals can irritate your face. This irritation could lead to more sebum production and make the problem worse. Use a moisturizer. If your skin is very dry, then your body will compensate by increasing sebum production. To prevent this from happening, use a gentle moisturizer after you wash your face every morning and evening. There are many treatments available at skin clinics, which can significantly reduce sebum production. They can be a little expensive, but can produce more long term results than other treatments. Microdermabrasion uses a rotating wire brush to exfoliate the top layers of skin, revealing the smooth new skin underneath. It can be somewhat uncomfortable and can leave the skin looking red and raw for a number of days until it has fully healed. High levels of androgen activity in women, may lead to excessive sebum production. Some causes that lead to hormonal changes may be puberty, pregnancy, amenorrhea or changes in medication. The best way to determine if excessive sebum production is caused by hormonal changes is to speak with a dermatologist. Light therapy targets the acne-causing bacteria on the surface of the skin, reducing inflammation and improving the texture of the skin. Laser therapy works by penetrating deep within the skin and damaging the sebaceous glands that produce sebum. Isotretinoin is closely related to vitamin A and reduces the body’s sebum production and shrinks the sebaceous glands. A course of isotretinoin usually lasts for about 20 weeks, during which time you must be closely monitored, due to the drug’s large number of potential side effects. Some of side effects associated with isotretinoin treatments include dry skin and eyes, cracked lips, sensitivity to sunlight, and more uncommonly, hair loss, headaches, and mood changes. This treatment has been linked with severe birth defects, so it cannot be prescribed to pregnant women or those who are trying to conceive. As a result, women will be asked to take a pregnancy test before being prescribed this medication. Accutane is a prescription oral medication. It works by shrinking the sebaceous glands, reducing the production of sebum. If you do not notice any improvements in your skin condition after 8 weeks, speak with a dermatologist. You shouldn’t take high doses of zinc for more than a few days unless your doctor tells you to. Speak with your doctor before taking zinc supplements.